In Miyazaki, no National Teams will play each other twice until the final medal day. TOKYO - The groups of the 6th IBAF Women’s Baseball World Cup were unveiled in Japan, along with a new competition format for the women’s flagship event, which will take place in Miyazaki, Japan from the 1st - 7th of September. In Group A, world No. 1 Japan, T-No. 3 Australia, No. 5 Venezuela and No. 13 Hong Kong will face off against each other. And in Group B, second-ranked United States, T-No. 3 Canada, No. 6 Chinese Taipei and No. 9 Netherlands will battle it out. A total of twenty-four Baseball World Cup games will be contested in Miyazaki, with each National Team competing in a total of six contests. Each group of nations will begin the Baseball World Cup competition with a three-match opening round-robin, with the top two nations with the best records advancing to the second round. In the second round (modified “semifinal”), the top two finishers from Group A will compete against the top two finishers of Group B; head-to-head results from the first-round will be taken into consideration when determining the medal match-ups after the first five contests of Rounds 1 and 2. The top two finishers through the second round will move on to the Baseball World Cup gold medal match, guaranteeing themselves at least a silver medal, while the bottom two teams will compete for the bronze. A similar format will be used for the bottom two Group A/Group B finishers of the opening round to determine 5th – 8th places. In Miyazaki, no National Teams will play each other twice until the final round on Sunday, September 7th. At the 2012 Women’s Baseball World Cup in Edmonton, Canada, a single round-robin format was implemented—Japan, Canada, USA and Australia finished atop the 2012 round-robin standings to qualify for the semifinal knockout round. 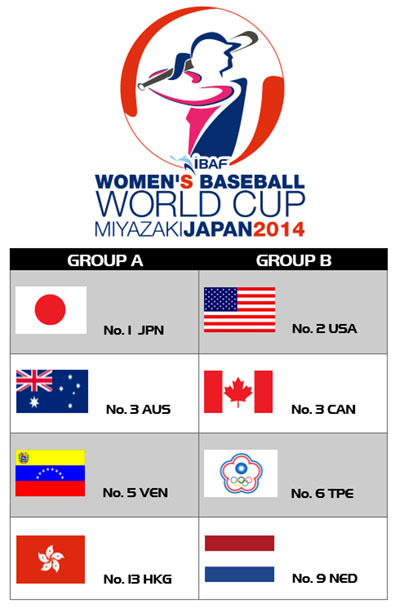 The 2014 Women’s Baseball World Cup gold medal match will take place at Sun Marine Stadium. The full schedule will be announced in the coming days.